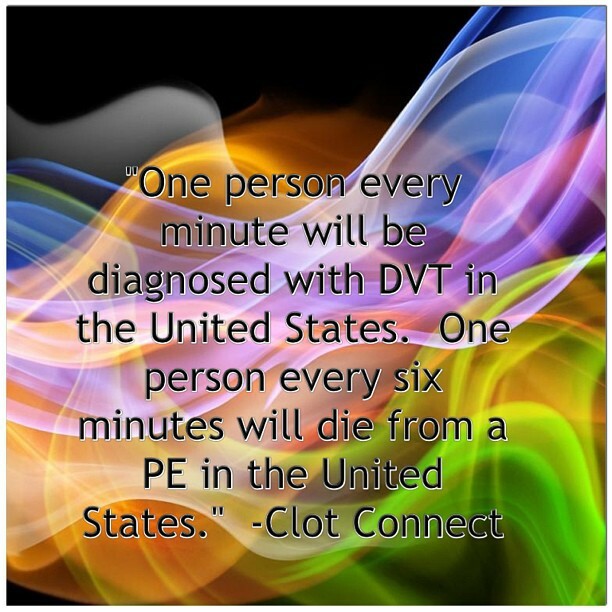 Recovery does not happen overnight – or sometimes even days, weeks or months after a PE and/or DVT. Physical recovery from a blood clot take anytime up to two years (or more or less, depending on the individual) and sometimes the emotional recovery from a blood clot can taken even longer. Physical and psychological complications can be long lasting and far-reaching. In the beginning of my recovery, I wanted to “get better” right away, and it was hard for me to understand why I didn’t feel better in a week or two – or even a month or six months or a year down the line. I had to learn to put myself first during my recovery – and that was not easy to do. I had to say no to things like meeting up with friends for dinner, a phone call to catch-up, cooking, cleaning the house and running errands. I had to say no to things that made me unhappy or uncomfortable – including people who did not support me during my recovery. It was very hard to put myself first, but it was a necessity. You have to come first during your recovery. Learn to say no and if you have things that need to get done in a given time period, ask your support network for assistance or advice. As you begin to heal, you can start to do things that you used to do or take on more tasks, but in the beginning, don’t be afraid to say no, or yes, and focus on yourself. Everything changed after I survived a blood clot and finding my new normal is an adjustment I am still working on to this day. Even more so than adjusting to what is the new normal, though, is recognizing that things can no longer be the same as they were – because I am not the same person coming out of this survival as I was going in. I have faced more pain, fear, uncertainty and failure than I ever thought possible. I have survived something many people do not. I have to live with the burden of a lifelong and complicated illness that I am still unsure of what the outcome will be. Do I have to give up the life I loved and the things that made me happy? No, I do not believe I or anyone does, but I do have a new perspective on life that is different than the one I had before. I have different limits, different expectations, different fears and a new appreciation for the life I have now. A blood clot changes everything. Give yourself the time and patience you deserve to adjust to that fact. There is hope for recovery. I will always have to manage my medication and risks that come with that. I still face the emotional burden of what happened to me, but I am working on it little by little. I wanted to give up so many times during my recovery, but somehow, I always managed to hope for a better tomorrow. I am passing that hope on to you. You can recover. You can make improvements. You can find support and love. Find something you are passionate about and keep your sights on a goal. For me, if I can help one other person going through the struggle of recovery, I know my own struggle was worth it. Find what makes you happy, what drives you – your children, your family, your career, your pets, your love of music or art, your creativity, your friends – anything – and hang on to the hope that in that happiness, you will succeed. Now that I survived a blood clot, what was next? Here are a few things I have discovered during the recovery process that are important for recovering, healing and ultimately moving on with the gift of life we, as Survivors, have been given. Please listen to me when I say – Please listen to your body because it can happen to you! 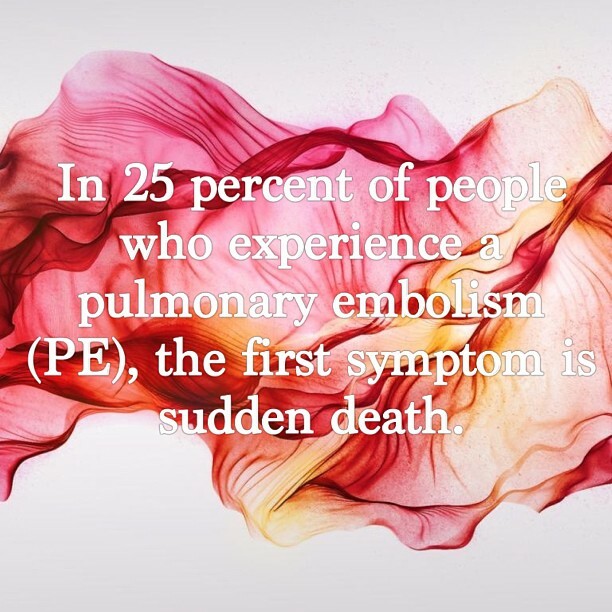 PE’s are a life-threatening complication of deep vein thrombosis, please seek emergency medical care immediately, as it can be fatal! You need to know in about half of all cases, deep vein thrombosis occurs without any noticeable symptoms. If something doesn’t seem right or you are at all concerned, make an appointment with your primary care physician to have it checked out before symptoms could potentially get worse and cause problems with your lungs or heart. You’re at risk for a dvt (and potentially a pe) if you are sitting for long periods of time, such as when driving or flying; have an inherited a blood-clotting disorder; are on prolonged bed rest, such as during a long hospital stay or paralysis; have had an injury or surgery; are pregnant; have cancer; have inflammatory bowel disease; have heart disease; take birth control or hormone replacement therapy; have a pacemaker or catheter; have had a dvt or pe previously; have a family history of dvt or pe; are overweight or obese; are a smoker; are over 6o years old; are tall; or are a female. That’s a lot of different people!! Do not let anyone (who is NOT your doctor), including yourself, tell you what you should or should not be doing when it comes to your health. Not shoulding yourself will allow you to take steps that help you to ultimately feel better about yourself and your health. And when it comes to someone else and his or her treatment – you are not them and he or she is not you. We may face common issues or diagnoses’, but at the end of the day, only you and your medical team can decide what is right for you. Find or create your Medical team. I have an Internal Medicine Dr who is my PCP (primary care physician). I have a Heart Dr from VA Heart Hospital and a clinic of Warfarin specialists who are constantly monitoring what I need to do and take. Always keep in contact with them. Make sure you find a Medical team that listens to you and responds quickly to your questions, it creates a peace of mind in that moment….which is very important for recovery.